Expedia is offering £30 off £40 spend or $30 USD off min $40 USD spend in the Things to do category. Appears to be one use per credit card per site. Use it for New Zealand, US, or anywhere else in the world. Expedia US may work out better in some situations. 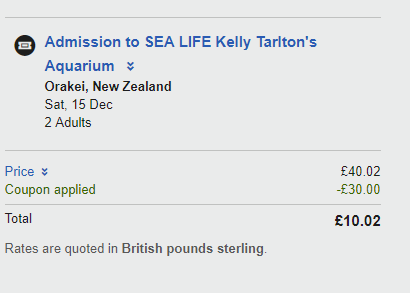 2 Adult Tickets to SEA LIFE Kelly Tarlton's Aquarium £10.02 ($18.56 NZD) on Expedia UK ($20.86 USD (~$30.37 NZD) on Expedia US). Screenshot. Normal Price for 2 tickets is $64 NZD.